This empowering CD of Anandamayi Shakti Chakra Meditation takes you on A Blissful Journey through 7- Wonders of the Soul. You will heal yourself, expand your consciousness, access the divinity inside of you, and live in harmony, happiness, and abundance as never before. This self-healing guided meditation focuses on each chakra and incorporates breathing, visualization, relaxing music, affirmations, and the sacred sound of the AUM Mantra. Chakras are the invisible, spinning, spiritual energy centers in our body. They govern our happiness, health, and spiritual well-being. Chakras function at an optimal level when in balance. When they are imbalanced, we can develop physical diseases and emotional disorders that cause disharmony in our body, mind, and soul. This CD guides you, step-by-step, to attain your inner happiness, heal your body, mind, chakras and emotional energy system through pure bliss and healing energy–Anandamayi Shakti. Chakra Guided Meditation CD contains an introduction to the chakra system, their location, spiritual qualities, causes and symptoms of imbalanced chakras, and instructions for activating, balancing, and healing of the chakras: Focus on each chakra, breathing, visualization, affirmations and sacred sound of the AUM Mantra. Channel the Anandamayi Shakti, the pure divine bliss and healing energy of each chakra Step-by-step, Anandamayi Shakti guides from the root chakra to the crown chakra Heal physical, mental, and emotional problems through the energies of each Chakra Experience: Fear-free, Stress-free, Worry-free living A positive attitude Self-awakening the divine state of consciousness- your True-Self Divine Power, Self-Expression, and your Psychic-Intuitive Power Divine Love, Peace and Infinite Bliss, Sat Chit Ananda. Oneness of Body-Mind-Soul Ultimate Happiness & Health – Your Total Well-being Pure Infinite Bliss Sharing Pure Bliss with others With continuous practice, you will enjoy your daily life, realize the ultimate purpose of your life, know yourself, and finally answer the famous question, Who am I? Disclaimer Note: The guided Chakras Meditation is not intended to replace medical treatments. Note: The proceeds generated by the sale of this book are donated to charitable and social activities. Being in the wellness industry for almost 2 decades and listening to and experiencing many guided meditation CD’s over the years–I know a thing or two about the subject. I have also been a mediation teacher for many years as well. 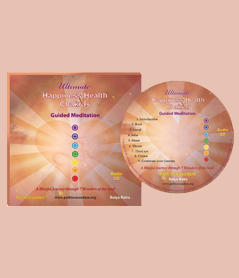 Satya Kalra’s Ultimate Happiness, Health, & Chakras Anandamayi Chakra Meditation CD is one of THE BEST for not only the understanding, but also the clearing and activating the entire Chakra System. She gives a great synopsis of the Chakra System and it’s positions, functions, colors, and associates the glands, organs etc. to give you an in-depth visualization and clearing when practicing the meditation. This is extremely helpful when imagining the chakras and how it relates to our body, mind, spirit, and aura. Because of her queue’s and guided imagery it makes the experience that more profound and strengthens the effects of this guided meditation. The OM or AUM mantra is pretty much the origin of all the other mantras and vibrates to the frequency of the universe–talk about powerful and healing. I love that she uses this mantra because it is simple, powerful, and you can immediately feel it’s effects. Great for first time meditators too and intro to using the amazing mantra–a tool of the mind. Her authentic spirit shines through her sweet, yet powerful voice and I just love to listen to it over and over again. Try using this CD before bed for 30 days straight and see the complete transformation your life will take. Satya Kalra’s messages come from deep within to better the lives of individuals worldwide. Her very essence allows people to learn more about ultimate happiness and chakras. This book will allow you to gain a greater sense of you personal consciousness, and will allow you to awaken your mind to many possibilities. I would definitely pick up a copy of this book. Allow yourself to explore your inner consciousness, and allow Satya Kalra to raise up your soul to a wonderful place. Check out what people are saying about “Ultimate Happiness Health & Chakras: A Blissful Journey through 7 Wonders of the Soul” on Amazon.com: Read More..
Satya Kalra is a 12 times bestselling author, happiness and self-transformational coach, meditation expert and spiritual guide. She is the former CEO from Biotech Industry in the Cancer arena and founder of the non-profit organization Path to Anandam. For over 35 years, Satya has been unfolding her understanding of higher consciousness and supreme health and happiness through meditations and studying the Bhagavad Gita and Yoga Sutra’s. Satya, popularly known for the Anandam Lifestyle (Blissful Living), has been engaged in promoting awareness, teaching the practice and applications of spirituality in daily life to improve total Wellness. For 25 enriching years, she has been teaching how to attain eternal happiness and peace within and how to reach your unlimited potential by raising your conscious level through the ultimate union of Body, Mind and Soul. She bridges science, spirituality, and practicality with easy, simple, yet very effective techniques and practices. Satya has coached and trained thousands of people on radio and T.V., at Universities and organizations, as well as entrepreneurs, CEO’s, managers and families worldwide.